Upgrades and new features keep Cisco Systems at the top of market for network switches. San Francisco, California October 10, 2006: Following a lackluster Q3, Cisco Systems emerges as the leader in the 10 Gigabit Ethernet Switch Market for the fourth quarter. Fueled by increased demand and an overall rise in the average selling price, Cisco experienced significant gains in a market of over $300 Million. With almost 70% of the projected $1.3 Billion 10-Gig market share and a more powerful, yet affordable design, the Catalyst 6500 is poised to cement Cisco as the dominating force in the industry. With the recent release of an eight-port, 10-Gigabit Ethernet module for the 6500, Cisco is quickly pulling away from the rest of the pack. In addition, upgrades like the Application Control Engine (ACE) module have prompted companies like Pure Video Networks to adopt Cisco switches to manage traffic of their popular video websites. Implementing simultaneous data center services such as server load balancing, integrated network and application switching/security, the ACE module delivers the highest performance in the industry. The ACE Simplifies application infrastructure by combining the functionality of multiple application delivery appliances into a single module, including server load balancing and off-load, Secure Socket Layer (SSL) protocol, security, and application optimization capabilities. Already the most successful networking switch on the IT market, the 6500 Series reduces existing operational costs and improves a network's ability to respond to intensive bandwidth demands. In general, customers using the services modules for the Catalyst 6500 reduce their total cost of ownership by taking advantage of simplified infrastructure, improved investment protection, pervasive security, and the high levels of performance, scalability, and innovative technologies. With over twenty unique service modules in five distinct categories, the Catalyst 6500 ranks among the most scalable, high-performance platform for integrated services. Currently, Cisco offers modules that address security issues, application, networking, network monitoring, wireless/mobility, and IP communications, which can be integrated into existing catalyst switches. Each modules offers upgraded performance and reinforces Cisco's hold on the market for network switches. 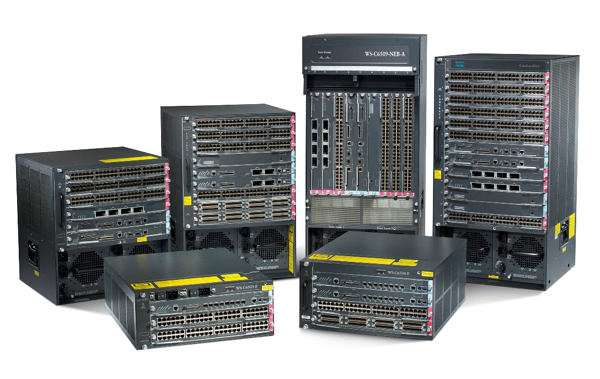 With more than $20 Billion is sales sine it's release in 1999, the 6500 Series switch has become the most popular networking platform ever. While Cisco has been able to fend off most threats to their position, rival Foundry Networks, and newcomer Force 10 have recently launched new 10Gbe ready products aimed at disrupting the company's market share. According to literature on Force 10's Terascale E-Series 1200, the E1200 boasts of more than double the ports of the Catalyst 6500 (1260 vs. 576 Ethernet ports/chassis). While this may be good news for the company, Force 10 has been focused on the data center vertical, and is therefore still untested in the enterprise market. Foundry's BigIron RX series switch has received favorable press for it's size/performance ratio and lower prices. With the launch of the new RX series, Foundry has mounted a consistent affront to Cisco's unchallenged reign. 0 Response to "Cisco's Catalyst 6500 Remains The Network Switch To Beat"